First, by alluding to the power of democracy over the lassitude of monarchy, Wilde was indulging his host country no doubt conscious of Canada’s fairly recent status as a self-governing dominion of the British Empire. But he was also taking care to be self-referential. Wilde’s then current work Vera; or, The Nihilists—his first brush with the establishment—is the story of a peasant girl who joins a cadre of Russian revolutionaries. Except that in the play for Kings read Czars. In Act II we see that Wilde echoes almost verbatim the sentiment of the Czarevitch in the play who says, “far off I hear the mighty wave Democracy break on these cursed shores.” The wave apparently sounding so imminent that the Czarevitch is immediately advised that he had better learn how to swim, although he needn’t have bothered: Wilde over-estimated perestroika by a hundred years. Perhaps what is more interesting than Wilde’s play, Vera, is the story behind its failed production. For this you can read Mason’s detailed bibliographic record which I have made available here. …the colors were beautiful. The dull grey waters flecked with green are lit with silver, being full of changing loveliness, for of all the most lovely colours are colours in motion. It was not till I stood underneath the Falls at Table Rock that I realized the majestic splendour and strength of the physical forces of nature here. At this point you will recall my promise while attending the Wilde on the Borders conference in Niagara Falls, NY, that I would test Wilde’s opinion of the Falls. So I emigrated to Canada on my day off to get a closer look. 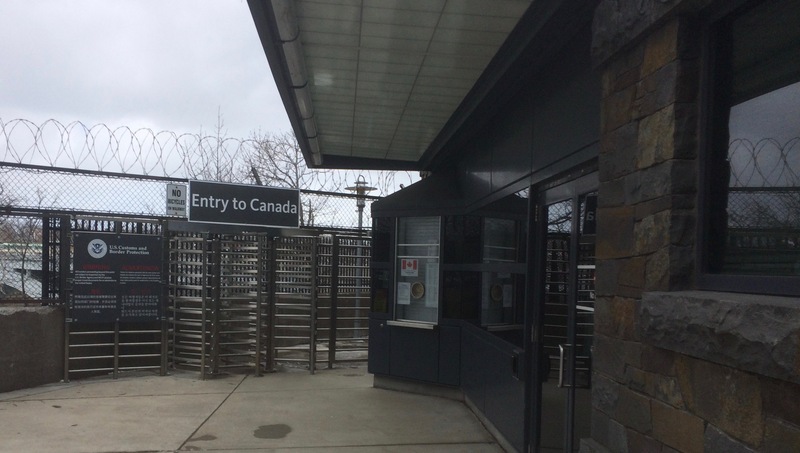 It is not often that one walks across an international border, at least not legally, and one reason people tend not to do it between the US and Canada at Niagara is that the crossing point is nigh on impossible to find. But substituting perseverance for any signpost one eventually finds an unmanned gate hidden behind a building in the corner of a parking lot. All that remains is to negotiate the ice and wind of a narrow no-man’s land 200 feet above the raging waters, and then satisfy the officious Customs person at the other end whose demeanor, even to the self-styled genius, is persuasive enough to ensure one has nothing to declare. 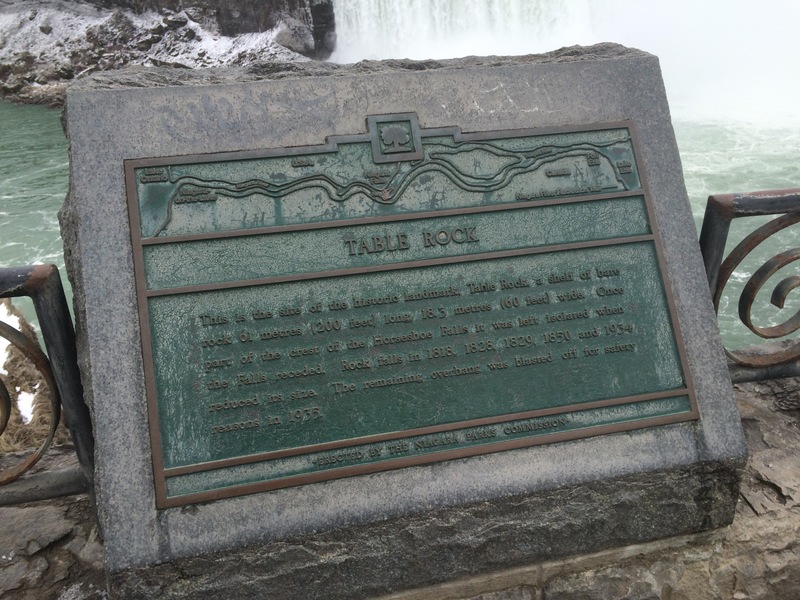 The first thing one discovers on nearing the Falls is that little remains of Table Rock, the first major vantage point for tourists of the early and mid-19th century. The erstwhile shelf that jutted out from the Canadian side had already suffered several collapses even before Wilde put his weight on it, and, after further rockfalls in 1897, the remaining ledge was blasted in 1935. But one can still stand near there, and, more importantly, one can approximate the position of Wilde’s hotel, The Prospect House, close to the Horseshoe Falls. This was my big moment—recapturing a historic event, provided, that is, the swirling mist and intermittent snow flurries didn’t fog up my spectacles too much preventing me from appreciating the gravity of the situation. The first thing to accept in appreciating the aesthetic movement of water is that there is likely to be less of the changing loveliness than in Wilde’s day owing to the industrial revolution in 1950 of diverting the river for power generation. However, we still get to see 100,000 cubic feet of water per second flowing in the wrong direction, and, I have to admit, there is a measure of majestic splendor. But Oscar was all wrong about the colors. Rather than grey waters flecked with green and lit with silver, it’s now green waters striped with white and no silver. But I’ll bet it’s just as wet. The artistic muse is a fickle mistress and 30 minutes of watery wondering at freezing point perched on jagged rocks amply introduces her, and my sense of awe, to the law of diminishing returns. 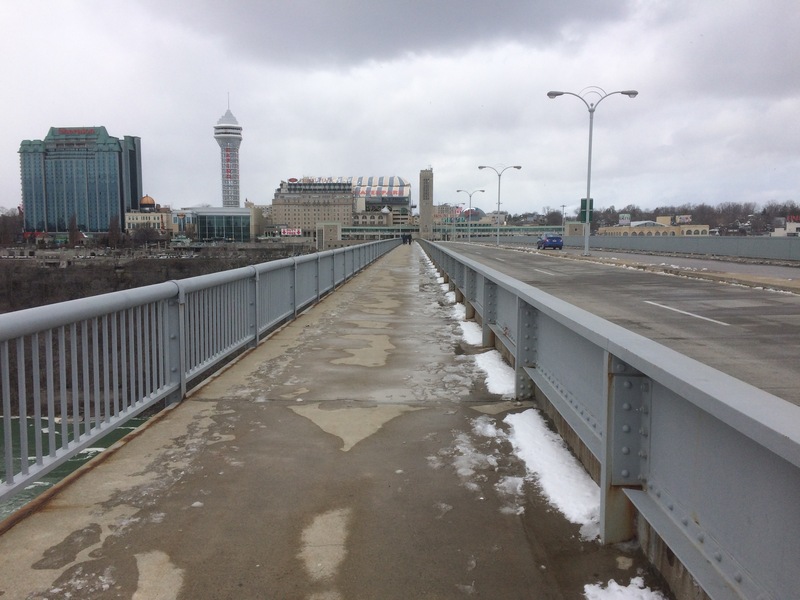 Thus Oscar’s initial ennui returned to the fore, and although one doesn’t quite lose the will to live, it is easy to see why Niagara Falls is such a popular spot for people in search of a life-changing experience. Take Bobby Leach, for example, who in 1911 went over the falls in a barrel. He spent the following six months in a hospital recovering from two broken knee caps and a fractured jaw. As a Cooper, ye olde barrel-makers, I feel slightly responsible. Or, take Jessie Sharp, who in 1990 negotiated this undulation of white water in a kayak fully intending to continue paddling along the river after the fall. So confident was he that he made dinner reservations at a restaurant in Lewiston, 4 miles downstream. His body was never recovered. A similar fate met Robert Overacker in 1995 when he zoomed over the falls on a Jet Ski to raise awareness of the homeless. His rocket-propelled parachute failed to open at the vital moment of take-off. An awareness of the gormless, as someone put it. All of this was enough for me to abandon the contemplation of colours in motion and make my way back to the United States, or as they say in the binary north, États-Unis, not having learned very much. My journey was made all the more profitless by one other consideration. 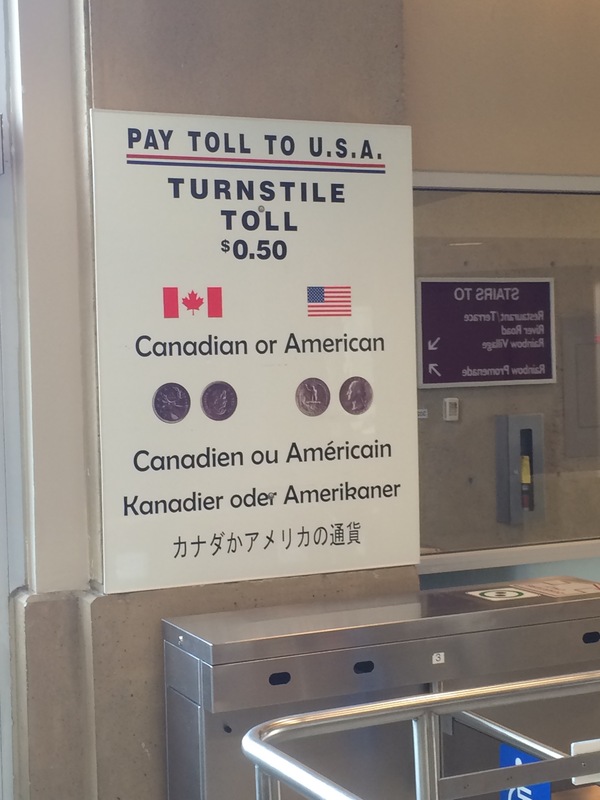 Despite my doing a little to confirm America as the home of the brave, I discovered it was not, on this occasion at least, the land of the free because it cost me fifty cents to get back in. I declined a trip on Maid of the Mist II when nobody could tell me what happened to Maid of the Mist I.